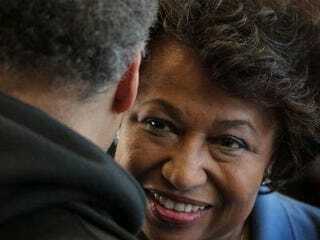 Rahm Emanuel's Off the Ballot: What About Carol Moseley Braun? The Illinios Appellate Court ruled today that Rahm Emanuel is not eligible to run for mayor of Chicago because he does not fulfill residency requirements. The ruling states that his name must be removed from the ballot. Of course, Emanuel, former chief of staff to Barack Obama, will appeal the ruling — but what does it mean for the Chicago mayoral race if he's really not allowed to run? A Chicago Tribune poll taken last week showed Emanuel with 44 percent of the vote. The closest second was former Sen. Carol Moseley Braun with 21 percent. If Rahm's really out, does that mean she's in? In other news: Charlie's Chocolate Angel.